I't soccer time. The big kids had their first practice and game on Sunday. They are all on the same team, the Little Dragons. We got lucky with our coaches, they were great with the kids and everyone had a fun first game. Will, Evan and Lily Clare all scored at least one goal, some for the other team, but the Little Dragons still went home with a win. Will on his way to a goal. After art class we explored the waterside at Laguna Gloria. A big family was fishing down at the docks. The dad, David, took interest in Evan (not that he had much choice, but he was v. good natured about it) and patiently showed him the fishing rod, bait and let him cast a few times. After a few tries Evan caught his first fish, this little Perch. Lily got to throw the fish back. David told me, "once a fisherman, always a fisherman". He may have made a convert. Lily Clare packed her own bag with her 'colors' for her first day of art camp today. She was intently working on a drawing project when I arrived to pick her up this afternoon. Today they explored drawing followed by painting the drawings with water colors. 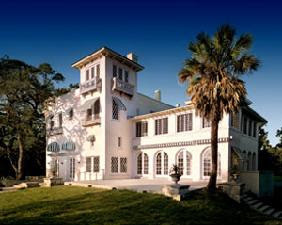 The class rooms are along the river on the beautiful grounds of Laguna Gloria with doors opening out to decks where the kids can view the water and peacocks. A nice spot for creativity. Three hours of drawing and painting...and after class she wanted to sit outside and draw some more. So we stayed for an extra half hour coloring and enjoying one of the prettiest days of the year. Lily Clare's teacher recommended that we look into art camps for her this summer. She says Lily Clare has a talent and passion for art. She spends lots of time on her drawings at school and home. Last week the class drew vehicles as part of their Transportation unit, I snapped this photo of her drawings before she gave them to her friend Devin. Below is her rendition of Devin's treehouse. I took the teachers advice and signed up Lily Clare for spring break art camp next week at Laguna Gloria - painting, drawing, self portraits and sculpting. She was very excited about the idea of art camp, but said she will need to put on something over her clothes so she doesn't get paint on her. I told her I would send her in play clothes so that she could get messy and just have fun. I think she will love being in an inspiring creative atmosphere that can nourish her artistry. Posting a few pics of how the kid's rooms turned out...graduated from cribs to big kid beds moved Lily Clare to her own room, and transfored the office into Holden's space. Holden enjoys sharing. His favorite pastime is managing an imaginary taco shack. Sometimes he likes sleeping in his big boy robot bed, but more often than not he prefers to cuddle with his mom and dad. Singing songs leads Holden to fits of giggles. He likes music and is developing a unique set of breakdancing and Capoeira moves. We've had a couple gory boo boos this week. Sunday, Will's foot got punctured by two tooth pick sized splinters. Luckily David was around to comfort him while I worked on extracting the wood. They went for a special ice cream treat afterwards...and I helped myself to a big bowl at home. Yesterday Evan got injured playing 'Jail' at the park. A bathroom door was slammed on his toes. I consider myself pretty good with wounds but this was a bit out of my league so David and I took him to our pediatrician. Evan wore his doctor outfit and was super brave, even pulling off the clipped toenail himself. Yuck. Followed by, well, more ice cream for the patient and myself. I think we've learned that keeping our shoes on is probably a good idea. I want to fly a Fighter Jet. I want to be a Big Boy. Will, Evan and Lily Clare have been learning about 'Community Helpers' at school. They were asked what they wanted to be when they grow up and it made for good dinner conversation last night. **Update. Lily Clare dressed up as a Vet for her class dress up day, Will went today as a Daddy - with tie and laptop computer. I was surprised to see that he still had his tie on when I picked him up. Pretty cute. Evan was a carpenter last week, only bc I remembered he needed a costume at the last minute and grabbed what was avail from the costume drawer on our way out to school. He was happy though. Evan is naturally inquisitive. He enjoys exploring mechanical devices of all kinds and learning how to operate them. Cars and solar panels are two subjects that fascinate him. His toy duck, Pato, is his most treasured item. His favorite book is Where the Wild Things Are and sometimes Evan acts like he is the king of the wild things. He has a passion for the art of photography and regularly confiscates his parents' smartphones and cameras for sessions during which he can captures stills of his family. 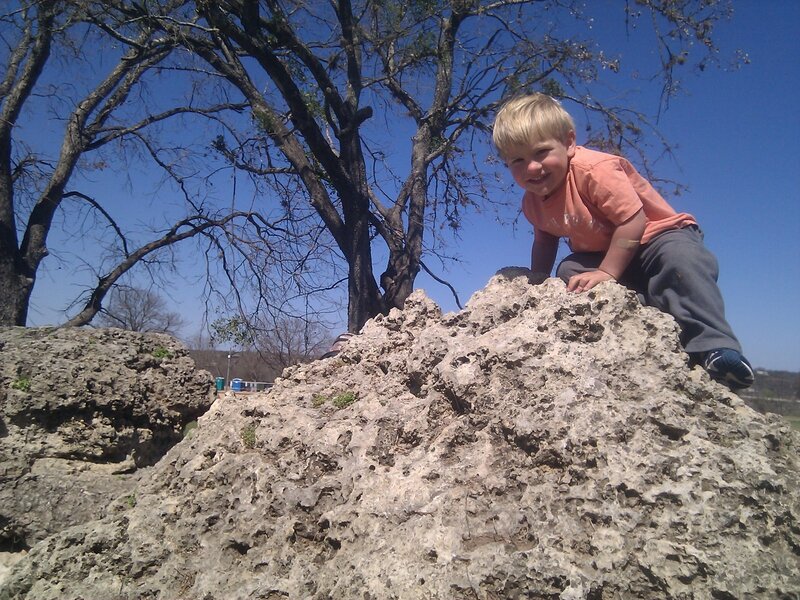 Evan is an excellent climber. At two years of age he was the first of his siblings to climb over the fence to escape the backyard. He earned his first trophy by participating in WAYA's gymnastics summer series, mastering a range of equipment and obstacle courses along the way. Now Evan summits trees, boulders, and all manner of playscape equipment. He has been honing his tent-making abilities and aspires to one day climb a mountain.